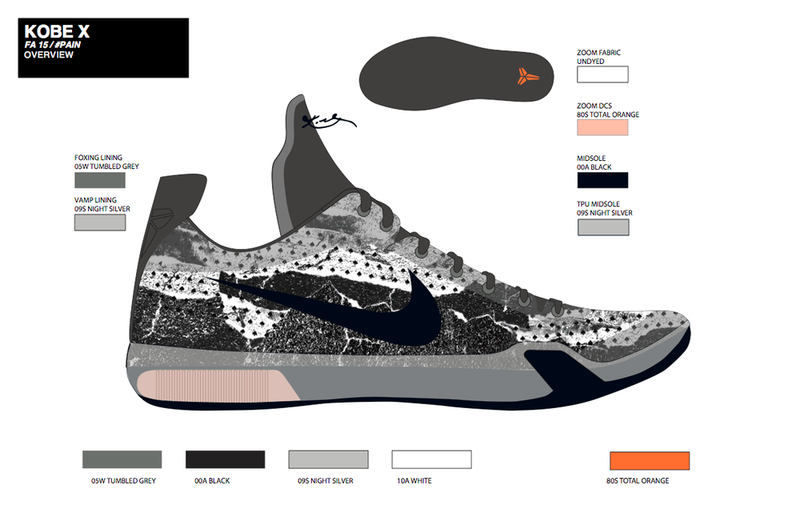 I was tasked to create a pattern that represented pain for the Kobe X. In order to express this feeling through design, I decided to scan in some found textures, print them out, and shred them into pieces. Eventually I began shredding them and piecing it on top of a Kobe X lay-flat. I added the polka dot spade, which represented his high school team, Lower Merion. "Kobe Bryant‘s alter ego known as the Black Mamba is a character that feeds off of pain. From the hardships of carrying a team that wasn’t even playoff worthy for a couple of seasons (having Smush Parker as the point guard on your squad will do that to you) to a more literal take on feeling physical agony during a grueling 82 game schedule, Kobe has seen it all over the course of his two decade NBA career. Pain has played a pivotal role in the growth of Bryant’s legend. The latest Kobe 10 colorway known as the Nike Kobe 10 “Pain” pays homage to his recent woes, as Kobe is currently in the midst of the twilight of his career. Based on the past injury ridden seasons, the upper features a mean cracked cement aesthetic while Team Orange spade polka dots add a unique twist."